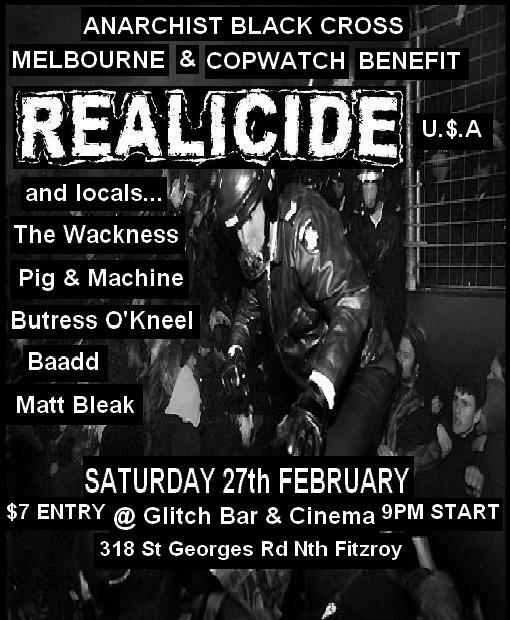 Anarchist Black Cross Melbourne and Copwatch present Realicide in a fundraising benefit Saturday 27th February. Starts 9pm featuring Realicide (us breakcore act), The Wackness, Pig and Machine, Buttress O’Kneel, Baadd and Matt Bleak. This entry was posted on January 23, 2010 at 10:47 pm and is filed under Uncategorized. You can follow any responses to this entry through the RSS 2.0 feed. You can leave a response, or trackback from your own site.